Our overall marketing objective is to catalyse positive conversations about health between peers and between parents and their children. (2) how much the Department spent on advertising the risks associated with Class (a) A, (b) B and (c) C drugs via the Frank drug information campaign in each of the last five years. The Department for Education does not explicitly fund drug education. School pupils are currently provided with education on the physiological effects of drugs as part of the statutory National Curriculum Programmes of Study for science. They may also receive wider drugs education as part of non-statutory personal, social, health and economic (PSHE) education. The FRANK service provides information and advice to young people about drugs. The Home Office, Department of Health and Department for Education work together to support the service. Funding is not allocated to advertising the risks associated with specific classes of drugs. Here’s an example of the sort of information and advice FRANK has been providing young people. The government have responded to the Home Affairs Select Committee’s report on drugs. The select committee’s recommendations covered a range of issues and as such so does the government’s response, but I’m going to focus on what it has to say about two recommendations. The Department of Health recently revealed that they’ve stopped contributing to the FRANK advertising budget. A Parliamentary Question by Conservative MP Nick de Bois showed that their last contribution was in 2009/10. The department continues to pay for the helpline, email, SMS and website parts of the service. How much did FRANK cost to relaunch? 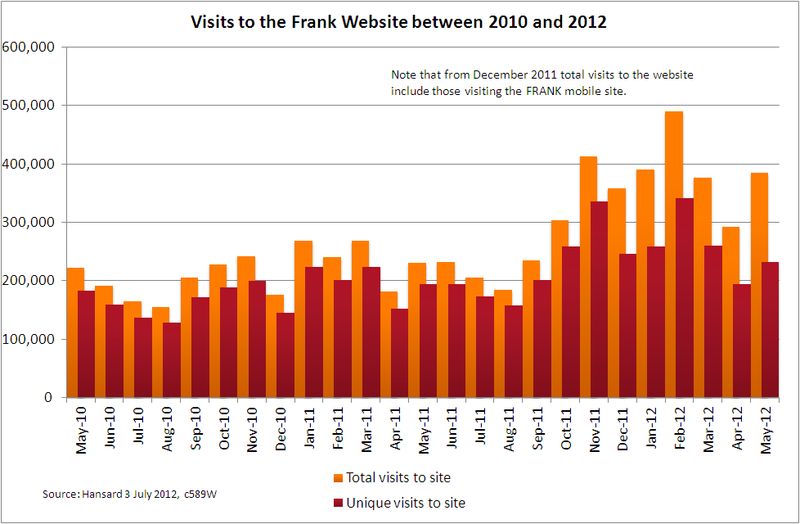 The total cost of the re-launch of the FRANK website was £199,000. This includes £145,000 to design, test and build the new website and £54,000 to design and build the mobile site. She has also given visitor numbers for the last two years. The site was relaunched in October 2011.